Tiang actually invited me to share how I use Evernote for my startup, but in the end I think I learn much more from the rest. It started off with Meng sharing how he used his evernote to keep track of his legal documents and he also shared a tip on how you could get direct access to the Evernote SQL database on your mac. >>> It’s a bit too technical for me but I find it quite interesting. I think the highlight came when the founder of Denso shared how his app can work seamless with Evernote. To me Denso is like readitlater for videos. It allows you to bookmark videos from a variety of sources and watches it later, whether you’re online or offline. You can watch Later on Evernote! 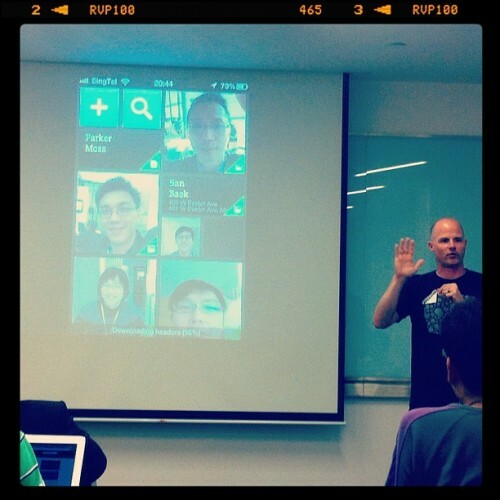 The last speaker was Troy the General Manager – Asia Pacific at Evernote. He shared his experience with Evernote Hello and talked about the direction of Evernote is heading into. We even talked about the trunk extension and the possibility of having an Singapore Evernote Hackerton just like the one last held in Korea. Next Post What I Learn From Timbuk2?